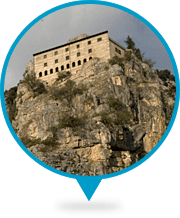 Between 1215 and 1216 St. Francis was a guest at the home of the Earls of Celano who at that time lived in the castle of Gagliano and made him a gift of a small church dedicated to Santa Maria, so he could have a place of meditation for himself and his brothers. Over the years, the brothers wanting to enlarge the small church, built a larger one which they then dedicated to the Holy founder. 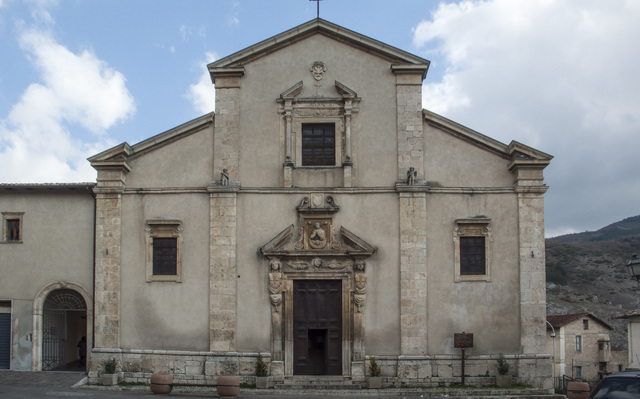 According to ancient tradition, the site of the original church would be the current chapel of St. Francis. 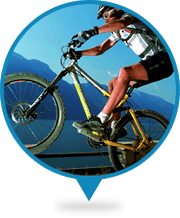 The works were eventually completed and the church was consecrated on August 29, 1288. The monastery would have been a primitive construction of modest proportions, and there still remain some Gothic windows on the eastern side of the convent from this first building. 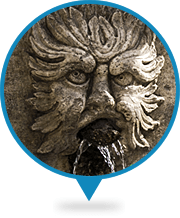 In the 14th century, because of the increased number of brothers and the increased work required of them, two wings were added to the early convent, which created a cloister at the centre of which was a cistern. 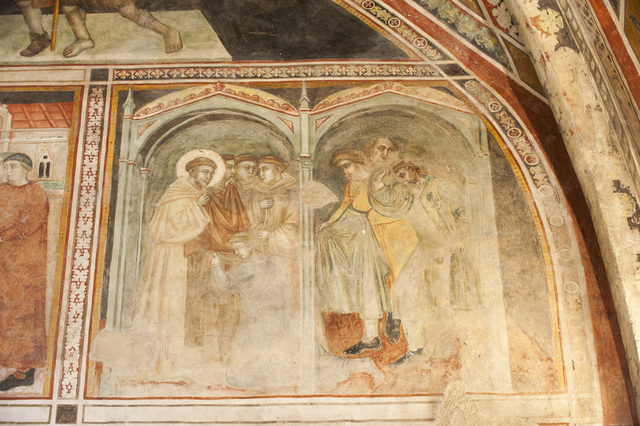 The cloister had a double loggia was in the Gothic style and was painted with scenes from the life of St. Francis. In 1530 changes to the 14th century cloister were begun: the mullioned windows were replaced - of which only one still remains - and the rooms were adorned with wooden coffered ceilings. The cloister which previously had wooden beams was restored with a brick vault. Between 1630 and 1660 the number of monks increased again and there was therefore a need for more space. Beside the old convent, on the north side, another convent with a new cloister was built. 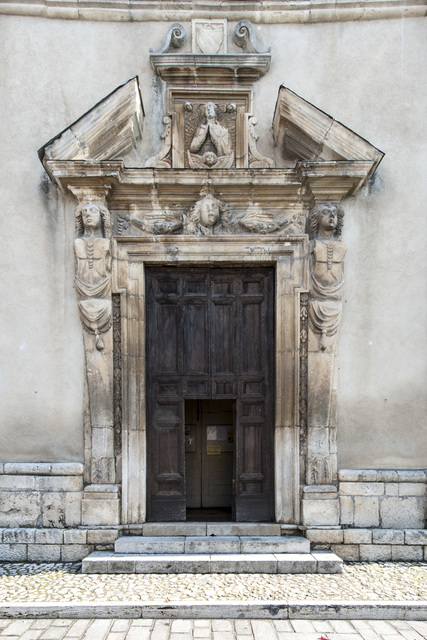 The Gothic portal of the church was replaced with the Baroque one which we can see today with a stone bust of the Immacolata in the centre of the tympanum. Higher up there is a more modern open window adorned with columns resting on two lions. Above the bust, within the architrave of the central window, the inscription giving the date of the work is repetated twice: A. DNI MDCXLVII. 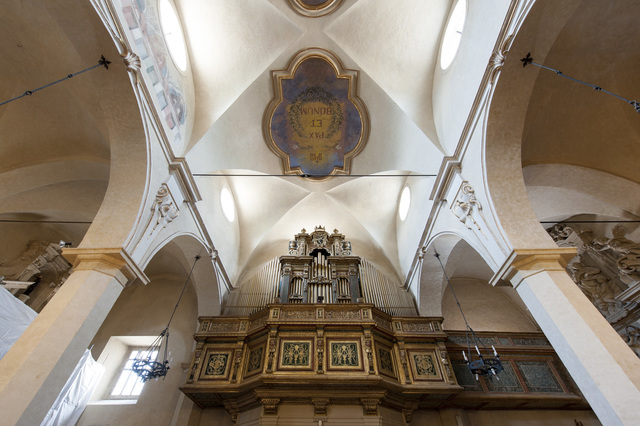 The chapel of San Francesco occupies the space of the church of Santa Maria. It is of a Gothic style and its painter is unfortunately unknown. 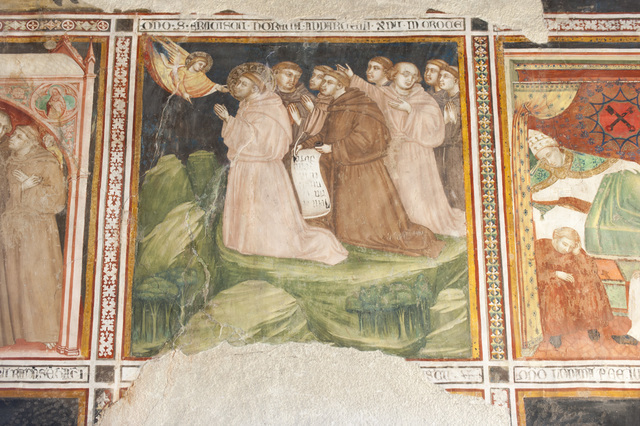 Almost all the paintings that adorn the walls of the Upper Basilica of St. Francis in Assisi are here in a miniature form. The chapel was disfigured in 1653 with the opening of the arch towards the side aisle of the church. 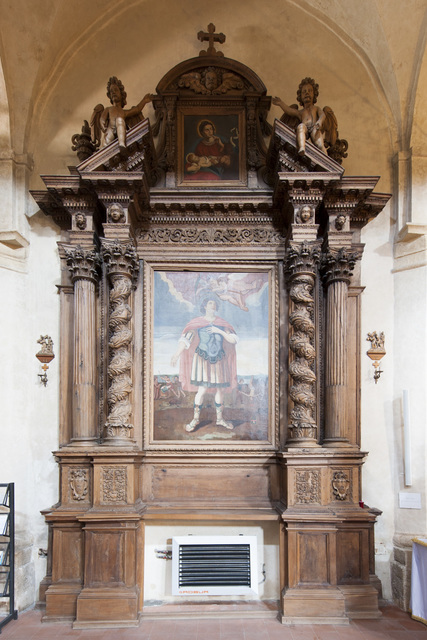 The old Gothic altar was demolished and replaced with a large Baroque altar in carved walnut and most of the paintings that adorned the front wall of the chapel were destroyed. 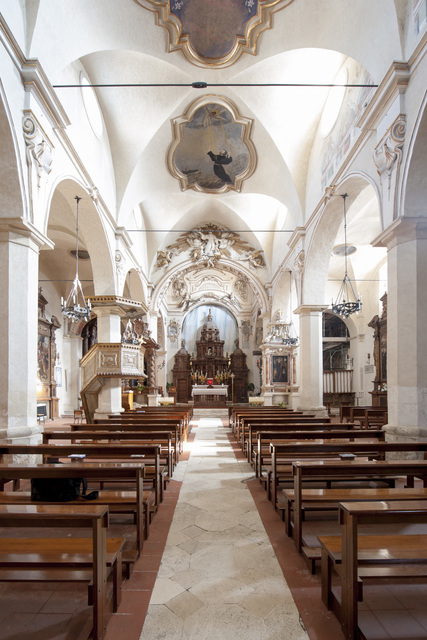 The altar is eight meters high and is decorated with 27 finely carved wooden statuettes, each of which is set into a small niche and decorated with friezes and columns. The work was commissioned by the Barons Pietropaoli who, at the time, lived in Castelvecchio and who wanted their emblem to be engraved on the sides of the altar and above the doors to the choir. The choir dates from the same period of the altar, and is also in walnut, but does not have the same artistic subtleties of the altar. In ancient times the choir was Gothic with the walls and the ceiling were all painted. Underneath the modern paint there are still fragments of frescoes from the 13th century.